Warehousing and micro-fulfillment are crucial for retailers to procure, produce, and distribute products to consumers. When it comes to what really matters to retailers and brands in terms of tech innovation, supply chain is high on the list. Download the free report to learn about the biggest emerging trends in retail and strategies to watch for 2019. While concepts like freight shipping, warehousing, and micro-fulfillment may lack flashiness, they are unequivocally important — ultimately representing a retailer or brand’s ability to procure, produce, and distribute products to consumers. Just last week, Adidas shares fell because of problems with its supply chain. 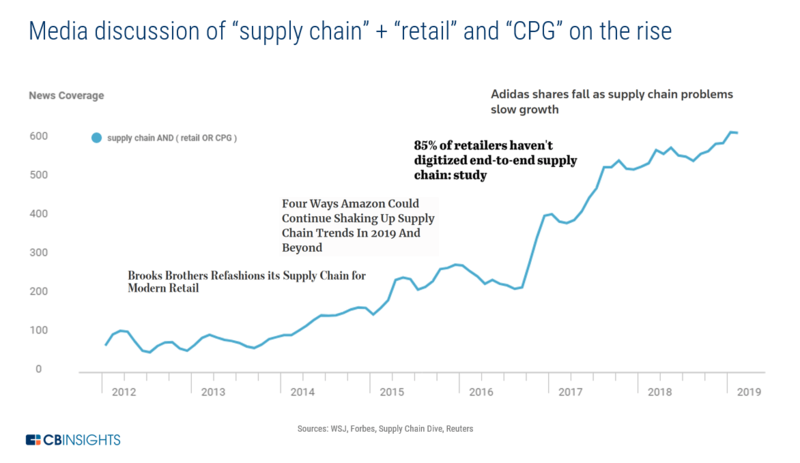 Supply chain tech innovation is a growing field, and it’s gaining more media attention — especially when it comes to retail and CPG. Funding to supply chain startups is growing as well. Last month, freight-forwarding startup Flexport and autonomous last-mile delivery startup Nuro both raised ~$1B rounds led by SoftBank. One trend that’s emerging at the nexus of supply chain and retail is micro-fulfillment centers — tiny, urban warehouses that autonomously fulfill online orders. Last-mile delivery remains a battleground for retailers, especially in the grocery space, which suffers from notoriously thin margins. By squeezing warehouses into dense urban areas, retailers can reduce the cost of last-mile delivery by cutting down the distance to customers. Retailers whose business model caters to online delivery while minimizing last mile-related costs will be at an advantage. 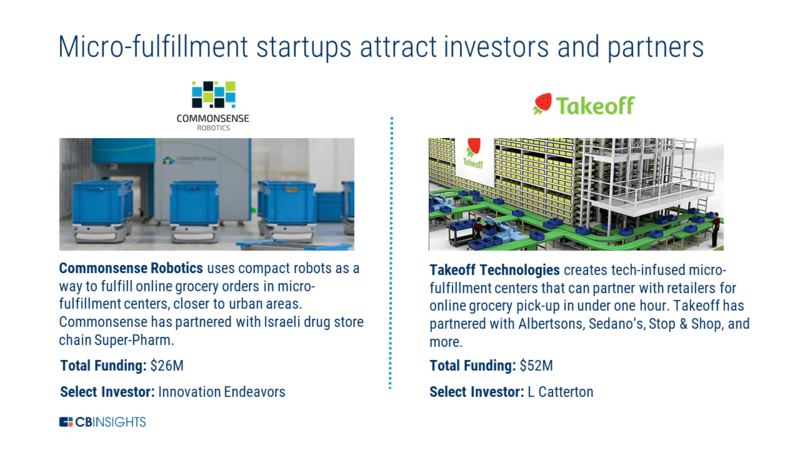 Two principal startups in the space are CommonSense Robotics and Takeoff Technologies. Both have recently partnered with grocery and other retailers including Albertsons, Stop & Shop, Sedano’s, and Israel-based Super-Pharm to deploy micro-fulfillment technology. Others, like Walmart, have also partnered to deploy similar technology. Micro-fulfillment doesn’t exist in a vacuum. Related trends including small-format urban stores and autonomous last-mile delivery are also gaining traction. Small format stores. Micro-fulfillment centers could be co-housed in small-format urban stores, made popular by retailers like Kohl’s and Target. Autonomous last-mile delivery. Micro-fulfillment startups could partner with autonomous last-mile delivery companies to create a (mostly) human-free distribution chain. CPG strategy. Brands could leverage micro-fulfillment technology as another route to bypass retailers and sell directly to consumers. Going forward, retailers and brands looking to stay in the competition will need to take actionable steps to digitize their supply chains. You may have the best product in the world, but if you can’t seamlessly distribute it to consumers, you’re already behind.